Florida is the definition of family vacation, and their huge variety of family-friendly resorts proves it. 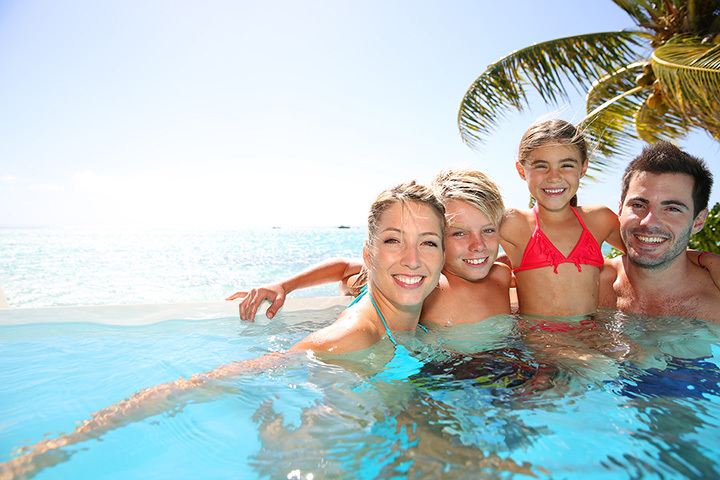 Families have just about every option when it comes to creating a memorable vacation. Whether you love roller coasters and water parks, camping and R&R, natural scenery and wildlife or miles of glistening shoreline, you’ll have an epic adventure at these 10 best resorts for families in Florida. Tucked away on the secluded island of Duck Key lies one of Florida’s best kept secrets. This little vacation retreat is ideal for families looking to unplug and get away from it all. It’s like a Caribbean getaway without the passport: lagoon-style swimming area and warm, sandy beaches are just a few of the reasons you’ll want to visit again and again. Just outside of Orlando lies every kid’s dream: a world full of LEGOS. This retreat has been created in true LEGO fashion, offering all the vibrant colors and designs that kids and adults alike will marvel over. Every room is a wonder, and the resort is in perfect proximity to the LEGOLAND theme parks. This beautifully pink resort has a lot to offer families: oceanfront views, direct beach access, condo-style suites with all the amenities, huge pools with waterfalls, water sports, and even on-site dolphin tours. Their restaurants are better than average resort food, offering something for every palate including a farm-to-table eatery. You truly never have to leave the resort until you’re heading home. Kids and parents alike are in for a treat here. There’s plenty to do for young and old, including a water slide, sandy poolside play area, beach volleyball court, bike rentals, restaurants, and swimming pools. Their pink beach is one of the most unique you’ll find anywhere. This interesting beachfront resort has kid-friendly written all over it (figuratively). Your kids won’t forget their time here enjoying the mini water park, pool, lazy river, dive-in theater, and arcade. Every room features all the amenities a family needs to keep both kids and parents happy. Their fans love the resort’s location, which is just a few minutes’ walk from some of the best sites in the city, including the beloved Pier Park. Parents love this place just as much as the kids do. Spacious multi-bedroom suites allow all the privacy you could ask for. On-site you’ll find a splash area, pool, and beach. Disney World, SeaWorld, Universal Studios, and Aquatica are a quick shuttle’s drive (best of all, the shuttle is free!). This timeless campground is modeled after the fictitious Jellystone Park and the picnic basket-stealing Yogi Bear. Kids love the waterslide, park trolley, swimming area, and other warm weather amenities. You’ve got your pick of several camping cabins, or you can bring your own RV. Not all resorts mean white sandy beaches and glistening lazy rivers. Sometimes, the best resorts are the basecamp for adventure, and that’s exactly the case when you stay in Lion Country. This KOA campground is a stone’s throw from an African Safari Experience, and your admission to the park is included in your stay. The camping resort also features kid-friendly favorites like a dog park, playground, and heated pool year-round. Though it’s not in California’s Hollywood, you and your family will still feel like stars here. Here, it’s all about a glittering ocean shoreline, oceanfront pools and waterslides, splash area, and poolside cabanas. Their exquisite on-site restaurants will leave no appetite untouched, even the pickiest eaters. Is this what paradise looks like to families? Their many guests say Yes! Sugar sand beaches, a heated pool, shuffleboard court, and picnic areas make this collection of Siesta Key boutique hotels attractive for family vacations. With its community-like vibe and variety of room types, there’s something for everyone here.